We had taken the kids and Mom to a “family show” with our perennial favorite, Billy Jonas. I found out about the concert completely by accident—was planning to send a CD to one of our relatives and discovered that he was going to be in town. Our family adores Billy Jonas. His music is imaginative, smart, funny, and very catchy. He uses a series of found items as instruments, including a bass drum made from a big blue plastic trash can, a Little Tikes chair, and a skateboard. He has drumsticks attached to his Vans which he uses to hit salad bowls, bells and horns. His CD “What Kind of Cat Are You?” was the only thing that quieted baby Margaret on a road trip to Maine several summers ago, and the effect was instantaneous and almost spooky. And Billy's concerts are wondrous. He is like the Pied Piper up there, able to teach words and motions in a way that is not at all tedious. Family concerts are a tough gig—you can tell immediately when you’re losing the audience. Yet he got the crowd back when attention spans waned. For his final song he brings people up on stage and has them “Bang and Sang” along with him on various instruments. We were sitting on the front row and somehow Caroline got invited up on stage. Then I stopped to see what she’d do. 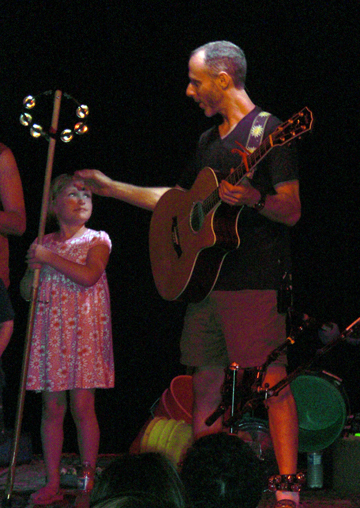 She went up on stage and Billy gave her the Nimbus 2000—a broom stick with a tambourine on top. He showed her the rhythm, a slightly complicated combination of shaking and tapping, which she did perfectly. Billy then proceeded to fiddle with some of the other stuff on stage to get ready for the song to begin. Meanwhile I readied the camera. I looked up to see Caroline conferring with this idol of her childhood. I heard her say, quietly but clearly, "I don't want to do this after all." He offered her another instrument which she declined. What was he going to do? I wondered. She came and sat back down and nestled into me, her eyes rimmed with that red that I remember so well from childhood, when I felt that I had pushed myself too far and felt embarrassed. Another girl was called forward and completed the task, looking at her parents the whole time with an expression of combined terror and shyness. It is so tough to know how hard to push a child. We don’t grow unless we stretch ourselves. On the other hand, being able to tell someone—especially an authority figure—”I don’t want to do this” is an incredible thing. I hope she will remember how to do this her whole life. We greeted Billy after the show and he thanked Caroline for coming on stage and also for saying what she was comfortable with. “That's a very brave thing to do,” he said. ...Have you had a moment of forthright clarity? What images come to mind when you consider what it means to "speak the truth in love"?